This column is intended to provide messages from the Tarot to address modern problems experienced by everyday people. Questioners, also known as “Querents” submit requests to have their issue addressed in a complimentary three card Tarot Reading published as part of the Magical Buffet. The reading not only addresses the Querent’s issue but also provides education about the role of Tarot as a tool for exploration and empowerment. It’s November, and love is in the air…at least it is for our Querent who will be referred to as Helena. She writes in wanting to know if the man she is seeing is as serious about the relationship as she is. Whether her relationship has long term commitment potential, and what obstacles she may face in this relationship as well as general advice for the future are also questions on her mind. For this reading the Russian Tarot of St. Petersburg is used. The resulting cards drawn are the 10 Pentacles, Knight Swords, and Wheel of Fortune. 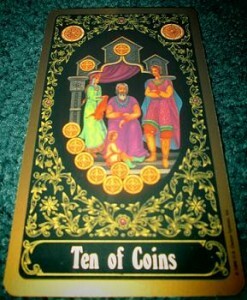 The 10 of Pentacles was drawn to show whether Mr. Man has long term commitment potential. When selecting cards for a reading in which specific questions are involved it is sometimes helpful to designate while shuffling what the specific question will be, like designating variables in an algebra equation. This card is associated with stability and commitment. Whereas the suit of cups would usually indicate emotional bonds and pentacles would indicate material stability, the 10 of Pentacles influences relationships but with a focus on the material aspects of nurturing. It indicates a commitment to providing long term stability, growth and protection for the benefit of a family. It indicates that growth is important to this individual, as is providing security in the relationship. Emotional commitment is likely to be demonstrated through work, provision of assets and resources, and development of material essentials and luxuries. Helena, you must be warned that in a way this person will seem married to their job, but that does not mean they are not committed to their relationship as well. Their business is important to them, but it is a commitment that serves as a vehicle through which this person can demonstrate their commitment to their relationship. Be aware this man will make decisions that seem more committed to work than to family or home, but to him it is a matter of following work to make things better for the home and family. This card indicates an approaching resolution to a work related conflict. More emphasis may have been placed on business than affection and romance recently, but it seems to be what this individual deems a necessary evil in order to be able to provide for those he cares about. This relationship has staying power but it will likely be expressed through generosity and material establishment, less through emotional expression and affection. In this relationship, working hard to provide material comforts is the expression of love. The next card is drawn to represent obstacles in this relationship. 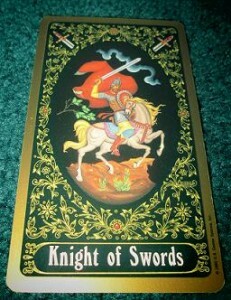 It is the Knight of Swords. Sudden change, action, restlessness are indicated by this card. Eagerness to push for results may bring overbearing energy which becomes confusing, counterproductive, and stressful. Impulsivity may need to be addressed as well. Pushing this relationship forward too aggressively or too quickly will pose an obstacle. Delivery of a message or communication regarding the need to change, move, proceed to the next level, or take action could also be problematic if the communication is made out of frustration, anger, or aggression. Be mindful to not lose your own footing in the haste and excitement to start a new life together, especially as it seems many changes will be taking place at once. These changes can threaten your foundation and sense of security and it is important to be open to growth and change as it occurs in this relationship without completely losing track of your own foundation and individual needs. Hastiness, impulsivity or a flaring temper can also be detrimental to this relationship. If either of you has an older child- of teen or young adult age- who is impulsive, passionate, and sometimes given to emotionally charged outbursts, it is likely that a conflict will arise out of this child’s adjustment to growth in the relationship, especially if it involves travel or new living arrangements. Expect a move or relocation to be stressful and frustrating, and be mindful of how anger is channeled and communicated. The final card in this spread is the Wheel of Fortune, numbered 10. It is the second ten in this three card spread, the first being the 10 of Pentacles. This indicates completion, the evolution and growth through a process that brings finality and a new beginning. It is likely that things come full circle in this relationship and many new opportunities for both of you as individuals and as a couple will unfold. Where you are headed now is not where you will end up, but it is through fortunate and fateful turns and twists that you will arrive at a much more successful end point than you could currently imagine. The turbulent and aggressive energy of the Knight of Swords suggests pushing for too much too fast will backfire in this relationship. 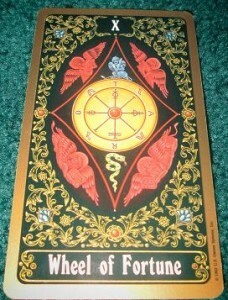 The Wheel of Fortune indicates that desire for change should be satisfied well enough by allowing fate and the universe to introduce opportunities, fortunate and unexpected, to alter the course of events, allowing you to navigate twists and turns and of course producing profound personal changes within this relationship. This card indicates success, luck and movement. A key to the best use of this energy is in your own ability to let go and allow the currents around you to lead the way. Pushing too strongly for an expected outcome will hinder larger potential growth and opportunities. This is an indicator of change and excitement. You will likely find yourself swept away from where you had established roots. You will be given opportunities that will inspire far reaching change on a personal level. Fortunate circumstances arise for both partners that allow you both to follow your personal visions, and evolve as a couple. It is important to not cling too tightly to a preconceived outcome. Twists and turns in this relationship will have fortunate outcomes for you but it is important to remain open to new ideas and experiences that challenge your previously planned courses of action. As you remain open to the twists and turns of fate remember that regardless of any reading or psychic advice you always have the free will to make choices. The Wheel of Fortune portends lucky opportunities unfolding around you. It is a Major Arcana card, therefore it speaks to larger matters related to your spiritual growth and can have ramifications for numerous areas of your life, your relationship being only one. The repetition of the number ten suggests advancement, growth and longevity for this relationship. As always, you still maintain free will to accept or disregard any advice depending on your own goals and needs. If at any time a relationship becomes toxic, threatening or abusive it is better to consider your own personal safety regardless of outside advice. This being a general statement not representing anything indicated in this reading, however. Remember that no matter where you are when you read this post, in NYS all readings are for entertainment only and are not substitution for legal, medical, or professional advice. Best of luck to you and enjoy the excitement of your growing relationship! Angela Kaufman has been exploring divination through Tarot cards over a decade. She is a Certified Professional Tarot Reader and formed Moonlight Tarot in 2009 which would become Moonlight Tarot LLC in 2010. Angela uses the Tarot to assist clients in exploring personal growth and development, and in accordance with New York State Law offers readings for entertainment purposes. Angela began providing readings on a professional, “Moonlighting” basis in order to provide affordable readings to those seeking guidance, inspiration and fun. Angela is also co-author of the new book “Wicca, What’s the Real Deal? Breaking Through the Misconceptions.” (Schiffer Publishing, 2011). In 2006 she joined ISIS Paranormal Investigations and has accompanied the team on numerous investigations in private residences and businesses throughout the capital region, Adirondacks, Vermont and Massachusetts.